Meetings at The Landing Resort & Spa manage to calm the spirit and inspire the mind at the very same time. Here, on the shoreline of South Lake Tahoe, corporate events assume or more relaxed rhythm – distinguished by venues with breathtaking lake views, luxurious accommodations, fun team building challenges and outstanding cuisine. Chic yet cozy meeting rooms and gathering spaces with fireplaces, elegant European-style interiors and lakefront terraces offer a truly unique sense of place that will foster connectivity and collaboration like no other South Lake Tahoe hotel can. Extraordinary event space, welcoming 20 to 300, is a given at this stunning waterfront Lake Tahoe location. To view floorplans and capacities for the various event venues at The Landing Resort & Spa. 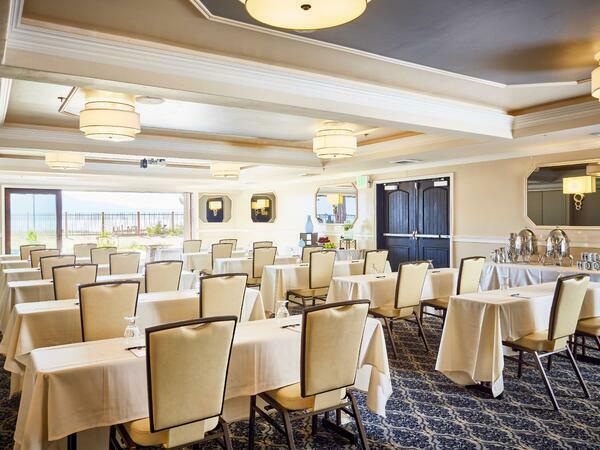 The indoor Lakeview Board Room and Lakeview Ballroom feature retractable glass walls, opening to a patio, the surrounding alpine landscape and views of Lake Tahoe waters. Jimmy's Restaurant combines intimate indoor and patio seating with internationally inspired cuisine and an extensive wine list. The heated Pavilion takes events to the great outdoors May-October. In warmer weather, the second-floor Grand Rooftop Terrace showcases spectacular panoramic vistas of South Lake Tahoe and beyond. Celebrate the Holidays at The Landing with an event in our Lakeside Grand Ballroom. Our holiday banquet packages include special holiday linens, centerpieces and a holiday tree and a welcome champagne toast. Our event planners are passionate about creating memorable occasions. Allow us to see to everything from venue selection and décor to customized catering cuisine, audiovisual arrays and accommodations for your guests. Get your group out of the “Bored Room” with a host of fun, exciting activities that build team spirit and foster camaraderie. You and your team are given a kit to assemble and create your own boat. Beginner or expert, enjoy various levels of rock climbing year round.